Biomechanics of Tendons and Ligaments: Tissue Reconstruction looks at the structure and function of tendons and ligaments. Biological and synthetic biomaterials for their reconstruction and regeneration are reviewed, and their biomechanical performance is discussed. Regeneration tendons and ligaments are soft connective tissues which are essential for the biomechanical function of the skeletal system. These tissues are often prone to injuries which can range from repetition and overuse, to tears and ruptures. 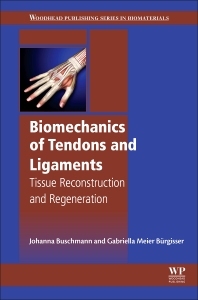 Understanding the biomechanical properties of ligaments and tendons is essential for their repair and regeneration. 2.5 Which tendon is the best (allo)graft in terms of material properties? Dr. Johanna Buschmann was educated as a chemist at the ETH Zurich. She is the leader of the research laboratories at the Department of Plastic and Hand Surgery at the University Hospital Zurich since 2008. Johanna is an active member of the Swiss Bone and Mineral Society and the Swiss Society for Biomaterials and Regenerative Medicine. She has reviewed articles for journals such as Biomaterials, Critical Reviews in Biomedical Engineering and Cytotherapy. Her main research activities lie in the field of tendon regeneration, tissue engineering and stem cell therapy. Gabriella Meier Bürgisser was educated as a biologist at the ETH Zurich, Switzerland (Master of Science). She is working at the University Hospital Zurich in the Clinic for Plastic Surgery and Hand Surgery. Her main research lies in the field of tendon repair. I can really recommend this book on the subject of tendon pathology. The book describes the current problems from different angles and also cites the most relevant research.